Maintaining a healthy weight is essential for healthy bones and an effectively functioning body. Sometimes illness, medications, or environmental factors however, cause a person's weight to fall below what's considered normal for their height. It's important in these cases that weight is regained in a healthy way. While it may tempting to reach for the junk food, these foods are likely to leave you feeling sluggish and bloated due to their saturated and trans fat content; when gaining weight, the aim should be to put on lean body mass at a steady rate. Gaining weight in a healthy way is all about increasing your calorie and unsaturated fat intake. The recommended daily allowance is 2,500 for men and 2,000 for females. So in order to gain weight it is important that you increase this amount. Many people assume that increasing their calorie consumption gives them a “free pass” to binge on junk foods, but such foods contain saturated and trans fats that not only endanger the cardiovascular system, but also leave you sluggish, bloated, and only temporarily satisfied.Try to get your calorie intake through healthy sources. Fibrous carbohydrates, like whole grain pasta, bread, and brown rice for example, provide plenty of energy without posing a risk to your health. Increasing the amount of unsaturated fats you consume is also beneficial; these fats, found in omega-3 sources, like avocado and oily fish, counteract and combat saturated and trans fats allowing you to gain lean - rather than flabby-body mass. 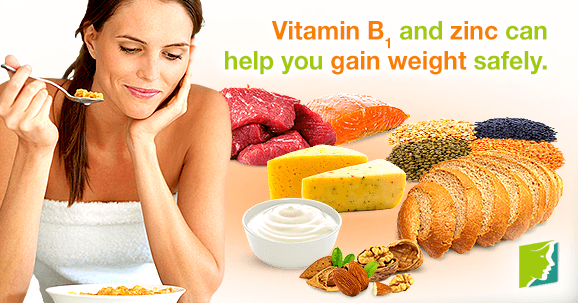 Supplementing your diet with the right vitamins and minerals could maximize your weight gain. Vitamin B1, also known as thiamine, has been linked to appetite as those with a deficiency often report weight loss. Increase your thiamine intake by making sure you eat plenty of bread, seeds, nuts, fish, and meat. Zinc may also play a role in weight maintenance, as it's a mineral that supports taste and smell. Ensure you are consuming fish, nuts, yogurt, cheese, and cereals to boost your intake. In addition, creatine is a nutrient that is normally found in the muscles, but can also be found in foods, such as fish and meat. Favored by athletes acquiring muscle mass, creatine helps maximize athletic performance by providing energy to the muscles. A diet plan aimed at supporting healthy weight gain is likely to provide increased energy levels. Additionally, while exercise is often associated with weight loss, certain types of exercise can also play a part in weight gain, too. Limit the amount of calorie-burning cardiovascular activity in your workout and spend a greater proportion of time working on resistance exercises. Use weights to build muscle mass. When you are trying to gain weight healthily, it's important to be patient; just as the weight did not fall off overnight, weight gain will not be immediately noticeable. Concentrate on eating well rather than gorging on foods that might provide immediate satisfaction. You will most likely notice extra energy as a result of a positive change to your diet; make good use of this by exercising to build muscle mass and maximize your weight gain.